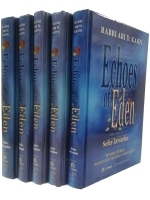 Drawing upon the vast reservoir of rabbinic literature – from Talmud to Midrash, from Zohar to the hasidic masters – Rabbi Ari Kahn combines the mystical explorations of kabbalah and hasidism with a highly intellectual and broad-minded approach to Torah study. Plumbing the depths of Jewish sources, Rabbi Kahn provides fascinating answers to age-old questions, infusing the parshah with fresh significance. Through provoking questions and intriguing insights, Rabbi Kahn continually inspires us to seek the Godly in our lives.